Yesterday's Featured Stamper (FS69) on SCS was Maren Benedict, aka mmbc on SCS ... and fellow Great Swaps Girl. I've had no time to stamp this week, but managed to quickly put this together last night. It's a super simple and quick card that cases Maren's fun card HERE. You can view Maren's beautiful gallery HERE, and see her blog, Zany Not Crazy HERE. As you can see, I changed the color scheme and theme, and Maren's card appears to be shorter than my A2 (4 1/4" x 5 1/2") card. 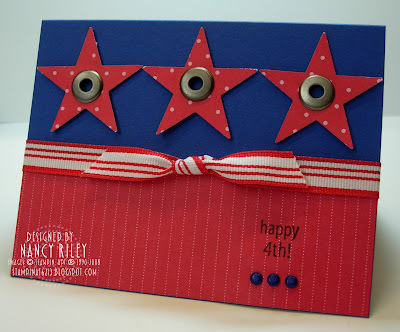 This is an awesome 4th of July card...good job on the challenge! Glad you had time to stamp! i love the way you changed the colors! It just POPS....WOW! Cute card Nancy, LOVE the fun design and colors. I just LOVE this!! What a great idea for the 4th! I can case this too, right?? Beautiful card!! Love your colors and the jumbo eyelets in the center! Super easy to do, but an awesome visual impact! TFS, Nancy! Nancy, what a great card!!! Perfect for the 4th! !